The Rising Stars Challenge only slightly resembles actual basketball. Greater effort will be extended on defense in pickup games across the country this morning. Cherry picking is frequent, heat checking is nearly a requirement, and exiting the game with no injuries (and plenty of fun) is the real goal. Not competition. Yet, make no mistake, Buddy Hield wanted to win the MVP in front of a sparse New Orleans crowd. No player attempted more shots than Hield's 22 and just one exceeded his 28 points. Of course the one player who did was none other than Jamal Murray, who poured in 36 points while shooting 13-19 from the field (9-14 behind the arc) while also contributing a game-leading 11 assists. The MVP appeared to be Hield's for the taking after a strong first half where he did far more damage inside the arc than behind it. At half Buddy led all scorers with 19 points including this impressive alley-oop, courtesy of an assist from Murray. If the first half was the Buddy Hield show, the second was certainly the Jamal Murray show. Murray scored 25 points in the second half alone coming alive behind the arc. After the game Murray described it his approach. "I wasn’t second-guessing. I was just taking heat checks." Still, as the clock wound down Murray was still deferring to the host and even passed up an open three on the left wing to set up Buddy for a three in the corner. Hield missed just a touch long. An MVP Buddy clearly wanted had been snatched by his closest rival. Does it matter? Of course not. The debate will continue on who the New Orleans Pelicans should have drafted and the Rising Stars Challenge will not even be a data point discussed. Three more matchups, all in the Pelicans' final ten games, are on the horizon this season with real stakes. The Denver Nuggets will try to hold onto the eighth and final playoff spot. Those three games provide a great opportunity for New Orleans to claw their way back to the second season. Hopefully both Buddy Hield and Jamal Murray put on a better show than their first head-to-head game on opening night. 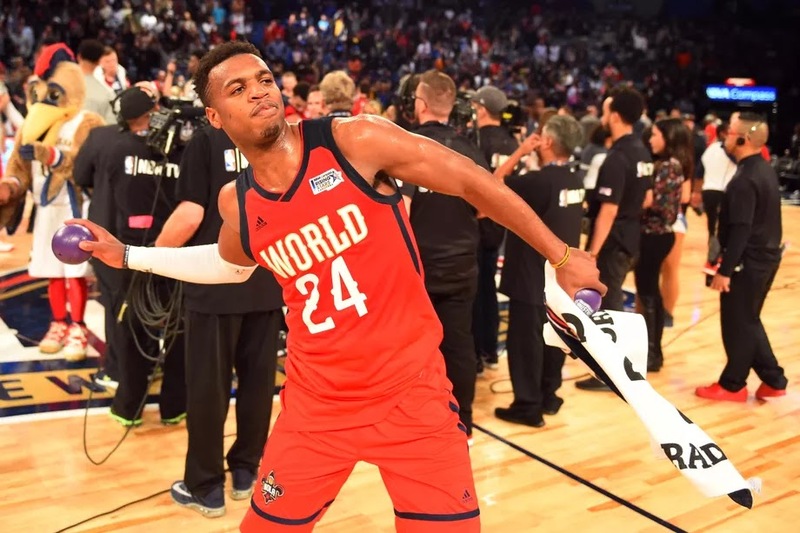 On Friday night Buddy Hield was good, and Jamal Murray still found a way to steal the limelight (and the trophy) with a strong second half. What better way for Buddy to get his revenge than to return the favor as the season winds down in March and April. Hield will be traded to Sacramento along with Tyreke Evans, Langston Galloway, and a future first and second-round draft pick in exchange for Demarcus Cousins and Omri Casspi, Adrian Wojnarowski of The Vertical reports. Hield will head to Sacramento and join the Kings' backcourt in what is one of the biggest blockbuster deals in recent memory. The loss of Cousins means the Kings could yet again be in rebuilding mode, with the team now lacking a certified impact player. Hield joins a crowded Sacramento frontcourt that already comprises of Arron Afflalo, Ben McLemore, Garrett Temple, Ty Lawson and Darren Collison, so it will be interesting to see how he is utilized, especially with Evans and Galloway also joining the Kings' ranks. The rookie guard is currently averaging 8.6 points and 2.9 rebounds on the season. Bayou Buddy is no more. Buddy Hield has been traded to the Sacramento Kings. The Kings acquired Hield, Langston Galloway, Tyreke Evans, and multiple picks for Demarcus Cousins and Omri Caspi. The news was first reported by Adrian Wojnarowski of The Vertical. Hield, who’s in his rookie season, played in just 57 games for New Orleans. He averaged just over eight points per game. The move unites Kentucky alums Demarcus Cousins and Anthony Davis together. The new look Pelicans face Oklahoma City on February 26th. 0 Response to "Buddy Hield shines in Rising Stars Challenge"